You may have seen many RO water purifiers with TDS controller or modular. But what does TDS controller or modular means, why it is required and what are their benefits? If you are having the same questions so keep on reading I am going to answer the same questions in this article. 1 What is the TDS controller or modular? What is the TDS controller or modular? A TDS controller allows you to control the TDS of the water. 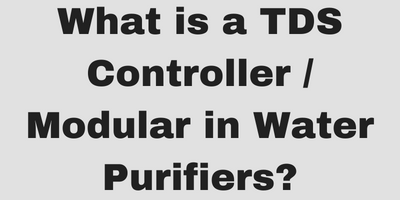 The TDS controller is basically a valve in the water purifier which mix two kinds of water i.e. the water purified by a RO purification and the water without RO purification. Now you might be thinking if it is a RO water purifier then why all the water is not purified with RO purification? It is essential not to purify all the water with RO purification to maintain proper TDS of the water. These dissolved solid could be essential minerals such as calcium, magnesium, Phosphorus, copper, iron and also they could be harmful dissolved solids and solids and heavy metals like mercury, arsenic and lead. RO water purifiers usually removals 90% of the total TDS of the water. So if the TDS of the water is 1000 PPM and it is purified by RO water purifier then the purified water will have TDS of 100 PPM which is not the ideal TDS of the water. The TDS between 250 to 500 PPM is considered as good for consumption. The water having TDS of 100 PPM will have low PH value as well which it is not good for health as well as it will not taste good as well. 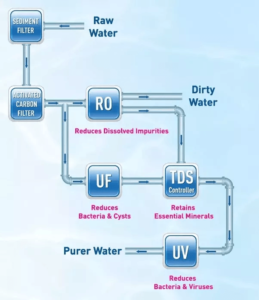 So to maintain the ideal TDS of the water, some of the water get purified through RO purification and some of the water get purified with UV and UF water purification. The TDS controller which is basically a valve adds enough amount of water not purified by RO purification to the water purified by RO purification to maintain ideal TDS of the water. The TDS controller and TDS modular are basically the same. TDS modular controls the TDS as well as it modulates the amount of TDS in the water.